Brace yourselves for an out-of-this-world and out-of-the-ordinary performance from a band overflowing with talent, creativity, fun, imagination, energy, and passion. Make way for Walk Off The Earth. 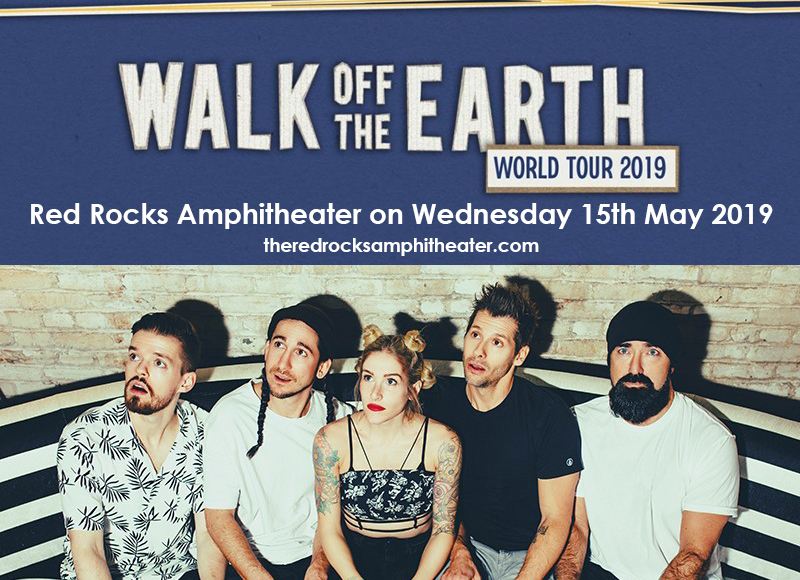 They're on an exciting tour force, headed towards the Red Rocks Amphitheater on Wednesday 15th May 2019. YouTube gave them global notoriety, hence Walk Off The Earth's legions of followers are now on the run to get their hands on tickets for the live show. Getting tickets is actually no sweat. With just a few clicks, you can buy tickets without leaving your seat. Catch this show while you can. Book your tickets now! Walk Off The Earth is crazy good! They became a viral, global phenom when they uploaded a video on Youtube of their mind-blowing rendition of Gotye’s “Somebody That I Used to Know”, with 5 band members all playing simultaneously using one guitar. Since then, the phones started ringing non-stop while their followers exploded in epidemic proportions. Yet unknown to many, Walk Off The Earth have been around for a decade releasing independent records, playing local gigs, and gathering a cult following in their native hometown in Burlington, Ontario in Canada. Band members Gianni Nicassio and Sarah Blackwood came up with the idea of doing unique cover songs on Youtube along with bandmates Ryan Marshall, Mike Taylor, and Joel Cassady. These multi-talented multi-instrumentalists also took on ultra innovative renditions of "Gangnam Style" by PSY and "Someone Like You" by Adele; while "Somebody That I Used To Know" raked in over 150 million views for that song alone. This amazing breakthrough gave them a major record deal as well as high-profile guesting stints including a performance on The Ellen DeGeneres Show. They also dished out a hit single with "Red Hands," which topped the Billboard Alternative Songs Chart in the US, and was certified double platinum in Canada; while bagging the Group of the Year award at the 2016 Juno Awards. The ultimate proof of their insane, jaw-dropping talent was tested before a live audience. And yes, Walk Off The Earth did not disappoint. They stunned their fans all the more with their signature bag of tricks like instrument-swapping and tossing in mid-song, kazoo playing, and their interactive and engaging banter with the audience. , books your tickets now!